Leadership Snohomish County (LSC) is the local nonprofit committed to county-specific leadership development. Founded in 1998, our mission is to connect, ignite and develop sustainable leaders to strengthen our communities. Our nine-month program provides education and opportunities to bring together professionals across all sectors to examine critical issues that impact Snohomish County. 1. unparalleled signature and young professionals programs. Leadership Snohomish County is the only leadership program specific to Snohomish County. Participants expand their leadership skills while gaining a greater commitment to community stewardship. 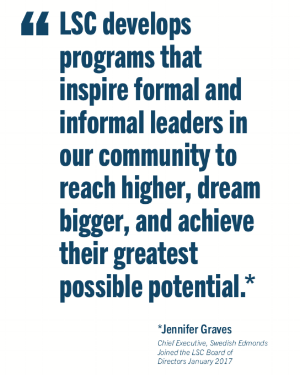 Offering a relevant and dynamic curriculum, Leadership Snohomish County gives participants new community-minded perspectives, resources and connections through an open and transformative forum. Our selection process is competitive, and the landscape of candidates is diverse and vibrant. 2. opportunities to COLLABORATE with our county's best and brightest. From the monthly networking lunches we host for our alumni to our annual celebratory community engagement breakfast known as Leadership Day (this year held in conjunction with our countywide SUMMIT 2038 visioning event that welcomed all voices) to growing our annual STEP UP conference to 600-plus, making us the largest equity convener in the region, Leadership Snohomish County creates events that forge connections, conversation and collaboration across the public, private and nonprofit sectors. 3. a stake — and a say — in where snohomish county is headed. Graphic Facilitator Catherine Bachy documents the SUMMIT 2038 discussions. Photo by William Wright Photography. Read the full article in the Herald Business Journal. If you're like us, you take a lot of pride living and working in Snohomish County. With the county expecting 250,000 additional residents by 2038, LSC sees that as a huge opportunity to help co-create the community we want. In collaboration with community partners across all sectors, we embarked on a civic engagement initiative known as SUMMIT 2038 that convened 120 individuals from all corners of the county so that people of all ages, professions and income levels would have their voices heard in visioning ahead for the next 20 years. Read the Herald Business Journal article to learn about the SUMMIT 2038 process. 4. Access to 700+ alumni invested in servant leadership in our region. Leadership Snohomish County just celebrated 20 years of cultivating leadership in the county, and our alumni continually sing our praises! Check out our 20th anniversary video below, featuring LSC alumni Rochelle Lubbers, Ciera Graham, Kurt Hintze, Vicci Hilty, Bill Tsoukalas, Andre Guzman and Chris Knapp. 5. inspiration to live your values on a daily basis. LSC connects, ignites and develops sustainable leaders to strengthen our communities. Whether just starting your career or in upper management, for-profit or nonprofit, small business or large corporation, elected official or government entity, let's work together to keep Snohomish County a grand place to live and work. Send us an email and say hello! LSC Alumni: Free for lunch? Join our regional leaders for lunch and hear the stories of their leadership journeys. Conversations will be organic, thought-provoking, and alumni-led. This monthly alumni benefit is provided thanks to generous sponsorship from Sno-Isle Libraries Foundation.